Dine in Unity is an opportunity to eat a warm meal at church before Wednesday evening activities begin. ALL are welcome to join in to eat and serve! It has been a successful program for the last few years and we're pleased to offer it again for the 2018-2019 school year! Dine in Unity success is only made possible through volunteers. Individuals, families paired together, and/or church groups are encouraged to volunteer to prepare, serve, & clean-up for a Dine-in-Unity meal. We typically serve approximately 30 people each week. 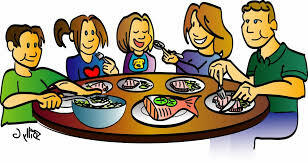 If you are able to prepare a meal, but unable to serve &/or clean-up, .... we will find help to assist you. Simply make a note in the comment section when you sign-up to prepare a meal. The available dates are listed below. Whether you help as an individual or team-up with others, it will be greatly appreciated by your church families. If you sign-up to serve a meal, please plan to arrive by 5:15 PM on regular Wednesday schedule or by 4:45 PM on Advent & Lent soup suppers. Regular Wednesday meals are served from 5:45 - 6:30 PM. Advent & Lent soup suppers are served from 5:00-6:00 PM. Thank you for your help with this important fellowship! If you need help with serving &/or clean-up, please make a note in "My Comments". We will find you some assistance.